We continue to obsess about Iran's fantasy weapons, but pay remarkably little attention to the existing nuclear weapons in the region—Israel's. Barack Obama came to Israel and Palestine, saw what he wanted to see, and conquered the mainstream media with his eloquent words. US and Israeli journalists called it a dream trip, the stuff that heroic myths are made of: a charismatic world leader taking charge of the Mideast peace process. But if the president doesn’t wake up and look at the hard realities he chose to ignore, his dream of being the great peacemaker will surely crumble, as it has before. I’ve been decrying the immorality of the occupation for four decades, yet I must admit I never dreamed I would hear an American president, standing in Jerusalem, do the same. Despite those words, however, Obama is no idealist. He’s a strategist. His Jerusalem speech was clearly meant to widen the gap between Israeli Prime Minister Benjamin Netanyahu and the substantial center-left portion of Israeli Jews, who are open to a deal with the Palestinians and showed unexpected strength in recent elections. The growing political tensions in Israel and a weakened prime minister give the American president a potential opening to maneuver, manipulate and perhaps even control the outcome of events. How to do so, though? Obama himself probably has no clear idea. Whatever Washington’s Middle Eastern script, when it comes to Israel and the Palestinians, it will require an extraordinary balancing act. The president will have to satisfy (or mollify) both the center-left and the right in Israel, strike an equally perfect balance between divergent Israeli and Palestinian demands, march with Netanyahu up to the edge of war with Iran yet keep Israel from plunging over that particular cliff, calibrate the ratcheting up of punishing sanctions and other acts in relation to Iran so finely that the Iranians will, in the end, yield to US demands without triggering a war, and prevent the Syrian civil war from spilling into Israel, which means controlling Lebanese politics, too. Don’t forget that he will have do it all while maintaining his liberal base at home and fending off the inevitable assault from the right. Oh, yes. Then there are all the as-yet-unforeseeable variables that will also have to be managed. To call it a tall order is an understatement. In American political culture, we expect no less from any president. After all, he is “the most powerful man in the world”—so he should be able to walk such a high wire adroitly, without fretting too much about the consequences, should he fall. Whatever else he may be doing, whenever an American president travels abroad, his overriding goal is to act out on the world stage a singular and deeply felt, if not always articulated, fantasy so many Americans love: that their leader and the nation he embodies have, like Superman, unlimited powers to control people and events around the globe. In this scenario, the president of the United States is a man above every fray, who understands the true needs of both sides in any conflict, as befits his uniquely exceptional nation. That’s why he can go anywhere—even Jerusalem or Ramallah—and tell the locals what is true and right and how they should behave. This mythic president can deftly maneuver his way across the most challenging of situations, sooner or later settling any dispute with a god-like sense of justice—and without ever losing his perfect balance. Like his country, he can be all things to all people. He never has to make painful sacrifices or suffer losses, as he proves that the American way will eventually triumph over all. To make this fantasy seem convincingly real, the president—and the faithful mainstream media who report it all—must turn every place he visits into a fantasyland. They must exclude realities that might quickly puncture the idealized image. But reality has a nasty habit of showing up, even when it’s least wanted. In fact, Israel is one place where the fantasy of US control comes reasonably close to reality. The president has substantially more power over the Israelis than his critics on the left give him credit for. Netanyahu’s embarrassing apology to Turkey (with no reciprocity from Turkey guaranteed), his release of tax funds to the Palestinian Authority just days after Obama’s visit and the truce that quickly ended Israel-Gaza fighting in November 2012, with a commitment to ease the blockade on Gaza, are only the latest of many examples of the way an American president can successfully pressure Israeli leaders. But despite that reality, Obama has once again proven remarkably incapable of forcing the Israelis into serious, good-faith negotiations with the Palestinians—mainly because he traveled to the Mideast with a stark reality in his pocket: the latest Gallup poll, showing American sympathy for Israel at an all-time high, while sympathy for the Palestinians has taken a nose-dive. As always, pro-Israel attitudes are substantially stronger among Republicans than the rest of the US public. If Obama pushes the Israelis to make genuine concessions for peace, he’ll give the GOP a huge opening to brand him as “soft on terrorists,” a label he has done everything possible to avoid—including assassinating American citizens. In the next breath, he contradicted the very premise of the myth of an eternally endangered, on-the-brink-of-being-wiped-out country by stating the obvious: “Those who adhere to the ideology of rejecting Israel’s right to exist might as well reject the earth beneath them and the sky above, because Israel is not going anywhere.” But he carefully ignored that fundamental reality during the rest of his visit, masking it behind a torrent of rhetoric about supposedly dire threats to Israel’s existence from every direction. Most Americans already assume that Israel is as imperiled as it claims to be. The more Obama reinforces that myth, the more sympathy he builds for Israel and the less Israeli leaders have to respond to pressure on negotiations with the Palestinians. And as long as most Americans mistakenly see Israelis, not Palestinians, as the besieged victims of the present situation, they’ll punish any president who puts real pressure on Israel to make a just peace. No president, not even in a second term, is likely to risk paying that price. Even if Obama did try to force a peace agreement on the Israelis, the effort would be doomed to fail, because he excluded from his fantasy world two crucial realities about Palestine. First, he treated the main roadblock to peace—the expansion of Jewish settlements in the West Bank—as if it hardly existed. Far from renewing his demand for an end to expansion, he fell back on the vague language we’ve heard from many presidents before: “We do not consider continued settlement activity to be constructive”; “Settlement activity is counterproductive to the cause of peace.” He even stood alongside Palestinian Authority President Mahmoud Abbas and called the settlements merely an “irritant,” a poor “excuse” to avoid coming to the peace table, more or less demanding that Abbas return to negotiations while Palestinian land continues to be eaten up, bit by bit. In effect, Obama pressured the Palestinians to accept a real evil in the present for the sake of some hypothetical good in a hard-to-imagine future. Though that may make sense to the president, the Palestinian Authority understandably sees it as senseless to enter prolonged negotiations that would simply give Israel a green light and more time to gobble up Palestinian land. In fact, Hamas leader Khaled Meshaal has been saying for years that his party is ready for a long-term truce that would, de facto, accept the existence of Israel inside its pre-1967 borders. These are, of course, the very borders Obama himself has called for as the basis for a final status agreement. In recent talks with the king of Jordan, Meshaal reportedly made his most explicit statement yet accepting such a two-state solution. The only realistic hope for peace is to encourage this growing moderation in Hamas, which would open the way to a unified Hamas-Fatah government. The idea of a Palestinian state in the West Bank alone, living happily side by side with Israel, while an impoverished and ignored Gaza somehow doesn’t cause trouble for anyone, is an impossible fantasy. But the Obama administration and the Israeli government prefer such a fantasy world in which there’s simply no place for a conciliatory Hamas policy, because the globe must always be divided between “the international community” and a threatening “radical Islam,” its banner held high by Hamas as well as Lebanon’s Hezbollah movement and the greatest threat of all: Iran. Iran evokes the most dangerous clash between reality and fantasy. Obama has struck a devil’s bargain with Netanyahu: if you’ll negotiate with the Palestinians, I’ll endorse your endless warnings about a purported Iranian program that might—just might—produce a tiny number of nuclear weapons at some unknown date in the imagined future. The very existence of such an Iranian program is highly doubtful. US intelligence agencies have concluded that it doesn’t exist. Yet on his recent trip, Obama plunged into the Israeli right’s fantasy world, where Iran will, sooner than you think, be nuking Jerusalem and Tel Aviv. To protect that fantasy world the president had to ignore the very existence of Dimona, the “research center” where Israel has produced anywhere from 100 to 300 nuclear weapons. As Jonathan Schell recently pointed out, Israel’s goal is to maintain its long-standing monopoly as the only nuclear power in the greater Middle East. Its leaders have been threatening for years to attack Iran to keep that monopoly a sure thing into the distant future. The American people seem perfectly ready to back them in this project. In the latest Gallup poll, 64 percent of Americans say that they sympathize with Israel and, chillingly, precisely the same percentage now tell Pew pollsters that they would support US military action to prevent Iran from making nukes. “Self-defense”? “Compelled”? “Israel’s existence”? It all assumes the absurd notion that, even if Iran could manage to produce a few nukes, its leaders would choose to use them against a massively superior Israel, swiftly triggering Iran's national suicide. That fantasy might provoke laughter in Tehran, but only if Iranian leaders could stop worrying for a moment about the very real threats being leveled at them. Unlike Obama, they’ve been looking directly at Dimona and its product for a long time. In the world as seen from Tehran, and from most of the rest of the planet, it’s Israel, not Iran, that poses a nuclear threat to the region. If someday there were a Mideast nuclear arms race, Israel would clearly be the country that set it off. And if Congress can sway the president, long before that the US might well be caught up in an Israeli-Iranian war. When the myth of Israel’s insecurity meets the myth of “the Iranian bomb,” the result has the potential to be explosive indeed. That’s a very real and heavy price to pay for the fantasy that a president can walk the high wire, balancing everyone’s demands perfectly, without the danger of simply falling into the abyss. 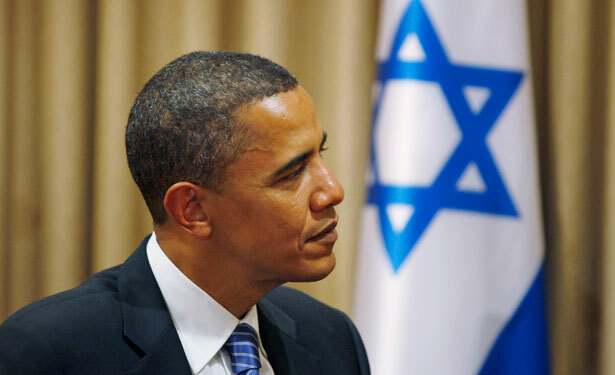 Barack Obama took a brave step out of that fantasy world when he told the Israeli people directly that their occupation of the West Bank is not only foolish but immoral. If he really wants to earn his Nobel Peace Prize, he’ll have to demand an end to settlement expansion, visit Gaza and Dimona, and create a new narrative about Iran as well as Palestine filled with a much larger dose of reality. That story just might have a happy ending, the hope and change that the president has always promised us. The script he has followed so far has tragedy written all over it. After slighting Paul Robeson and supporting the Vietnam War, Jackie Robinson came around on US imperialism. Read Dave Zirin's account.